Around 7:20 pm tonight sources were reporting a possible fire at a local spa business. Reports of smoke seen and a fire alarm has been activated. It happened at Weiss Morris Dayspa at 6555 Lexus Drive in Rockford. The Belvidere/Boone County Metro Narcotics Unit concludes a drug investigation with the arrest of two Rockford men on felony drug charges. Michael J. Franks, age 49, of Rockford, was charged with two counts of Unlawful Delivery of a Controlled Substance, crack cocaine (Class 1 Felony). Quintryell A. Hill, age 39 of Rockford, was charged with two counts of Criminal Drug Conspiracy (Class 1 Felony). On Tuesday, August 21st, the Belvidere/Boone County Metro Narcotics Unit arrested Michael J. Franks in Winnebago County on a Boone County arrest warrant for two counts of Unlawful Delivery of a Controlled Substance (Class 1 Felony). Franks was transported to Boone county was subsequently lodged into the Boone County Jail in lieu of $100,000 10% bond. Investigators also served an arrest warrant on Quintryell A. Hill at the Winnebago County Jail for two counts of Criminal Drug Conspiracy (Class 1 Felony). Hill is currently housed at the Winnebago County Jail on an unrelated case. All charges were reviewed and approved by the Boone County State’s Attorney Office. Anyone with information regarding suspicious activity is encouraged to contact the Belvidere Police Department at 815-547-6433 or Boone County Crimestoppers at 815-544-7867 (815-547-stop) and www.boonecountycrimestoppers.com. Persons with information leading to an arrest can be provided with a cash reward of up to $1000.00. Members of the public are reminded that these are only charges and are not proof of the defendant’s guilt. Every defendant is presumed innocent and is entitled to a fair trial in which it is the state’s burden to prove his or her guilt beyond a reasonable doubt. Just before 6 pm tonight, several emergency personnel were responding to a call, a small child was hit by a vehicle in Rockford. It happened in the area of Acorn and Rockton. Reports of a small child around 3 years old, was hit by a vehicle. Injuries were being reported. unknown on the severity of the injuries. This is still developing, check back later for possible updates. Another violent afternoon in the city. Sources are reporting a murder near the Janesville area. The victim was at the Mercy Hospital and was being treated when he passed away from his injuries. The victim was stabbed in the chest area. The victim Robert Thomas jr approx. 26 years old from Janesville. The suspect Sarina Stone (Sp?) approx. 20 years old from Janesville was arrested for 1st degree murder. The suspect and the victim got into an argument in the 2700 block of Wall st, then she stabbed him in the chest. After stabbing him in the chest she drove him to the emergency room. This is the 1st homicide in 2018 in Janesville. Sources have reported a few local businesses have bedbugs. We have yet to confirm this so I won’t be naming the businesses yet, but figured it would be a good article to do and we wanted to make people aware of what bedbugs are and how to deal with them. The common bed bug (Cimex lectularius) has long been a pest – feeding on blood, causing itchy bites and generally irritating their human hosts. The Environmental Protection Agency (EPA), the Centers for Disease Control and Prevention (CDC), and the United States Department of Agriculture (USDA) all consider bed bugs a public health pest. However, unlike most public health pests, bed bugs are not known to transmit or spread disease. They can, however, cause other public health issues, so it’s important to pay close attention to preventing and controlling bed bugs. Experts believe the recent increase in bed bugs in the United States may be due to more travel, lack of knowledge about preventing infestations, increased resistance of bed bugs to pesticides, and ineffective pest control practices. The good news is that there are ways to control bed bugs. Getting good, solid information is the first step in both prevention and control. While there is no chemical quick fix, there are effective strategies to control bed bugs involving both non-chemical and chemical methods. smelly, with a “musty-sweetish” odor produced through glands on the lower side of the body. if not recently fed, can be nearly invisible to the naked eye because of coloring and size. marked by an eye spot if more than five days old. 1st stage nymph (1.5 mm). 2nd stage nymph (2 mm). 3rd stage nymph (2.5 mm). 4th stage nymph (3 mm). 5th stage nymph (4.5 mm). If you have an infestation, it is best to find it early, before the infestation becomes established or spreads. Treating a minor infestation, while an inconvenience, is far less costly and easier than treating the same infestation after it becomes more widespread. However, low-level infestations are also much more challenging to find and correctly identify. Other insects, such as carpet beetles, can be easily mistaken for bed bugs. If you misidentify a bed bug infestation, it gives the bugs more time to spread to other areas of the house or hitchhike a ride to someone else’s house to start a new infestation. Learn about identifying bed bugs. Bites on the skin are a poor indicator of a bed bug infestation. Bed bug bites can look like bites from other insects (such as mosquitoes or chiggers), rashes (such as eczema or fungal infections), or even hives. Some people do not react to bed bug bites at all. Can you treat and eliminate the bed bugs on your own? Bed bugs are challenging pests to get rid of, since they hide so well and reproduce so quickly. In addition, the egg stage is resistant to many forms of treatment, so a single attempt may not be sufficient to complete the job. Ability of all of the residents to participate. Achieving complete control can take weeks to months, depending on the nature and extent of the infestation, and everyone will need to cooperate and do their part. Inspect infested areas, plus surrounding living spaces, to determine extent of infestation. Collect a sample to show an extension agent or other reliable expert in entomology. Extension agents are trained in pest control issues and know your local area. If you have bed bugs and live in an apartment, notify your landlord, because the units surrounding yours should be inspected. Landlords may have a responsibility to participate in treatment. Check the housing codes and laws in your area. Using a calendar, map out each stage based on the recommendations in the following sections. Plan to keep records through the whole process – including dates and locations when pests are found. Leave time for long-term monitoring to make sure all of the bed bugs are gone. Anything removed from the room should be placed in a sealed plastic bag and treated. Items that cannot be treated should be placed in a sealed plastic bag and left for an extended period of time to ensure any active bugs are dead (research shows variation in the length of time needed, but it can be as long as a year). Empty the vacuum after each use. Seal the bag and throw it out in an outdoor trash container. 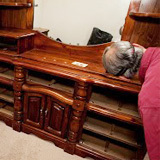 Don’t discard furniture if you can eliminate the bed bugs from it. Rip covers and remove stuffing from furniture items. Take steps to have infested items picked up as soon as possible by the trash collection agency. Jumping straight into control is tempting, but won’t work. Preparing for treatment is essential to getting successful control. It will also help by making it easier for you to monitor for bed bugs that haven’t been completely eliminated. This preparation should be conducted whether you are doing the treatment yourself or hiring a professional. Learn about treatment options (PDF). Make sure the methods you select are safe, effective and legal. See What’s Legal, What’s Not for more information. Consider non-chemical methods of killing bed bugs. Some will be more useful than others. Heat treatment using a clothes dryer on high heat, black plastic bags in the sun or a hot, closed car (pest management professionals have other methods that are not suitable for non-trained individuals to use). Cold treatment can be successful in the home environment if the freezer is set to 0o F. You must leave the items in the freezer at that temperature for four days. Always use a thermometer to check the temperature, since home freezers are not always set to 0o. Steam cleaners (wet or dry) can penetrate into cracks and fabrics to treat carpets, baseboards, bed frames, and other furniture. Steam temperature must be at least 130o F, but should not have a forceful airflow (use diffuser) or it may cause bed bugs to scatter. Reducing the numbers of bugs with these and other non-chemical methods is helpful, but is unlikely to entirely eliminate the infestation. If needed, use pesticides carefully according to the label directions or hire a pest management professional. Bed bugs must be listed on the label. Use foggers (bug bombs) only with extreme care. Improper use can harm your health or cause a fire/explosion. Because foggers work with a broadcast spraying action, they should not be used as the sole source of bed bug control. The spray will not reach the cracks and crevices where bed bugs hide. See Should I Use a Fogger? Every few days after you complete your initial cleanup and control processes, carefully look for any evidence of bed bugs. If you see bed bugs, that means that either the initial cleanup missed some individuals or that eggs have hatched (finding and removing or killing all eggs can be very difficult) and retreatment may be needed. If repeated treatments are needed, consider using pesticides with different modes of action. Desiccants (drying agents) can be particularly effective in some situations since they work by drying out the bug (which means the bed bugs can’t develop resistance to it). If using desiccants, be sure to use only products registered as a pesticide. Do not use pool or food-grade diatomaceous earth – this type of diatomaceous earth can harm you when you breathe it in. The pesticide version uses a different size of diatoms, which reduces the hazard. Desiccants can be very effective; however, they can take up to several months to work. Continue to inspect for presence of bed bugs, at least every 7 days, in case any eggs remained. Interceptors (placed under the legs of furniture to catch bed bugs and keep them from climbing the legs; commercial and do-it-yourself versions available), traps or other methods of monitoring can be used. Continue to implement preventive measures.